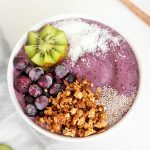 This scrumptious Blueberry Banana Smoothie Bowl consists of only 5 simple ingredients and tastes just as good as one you’d find in a cafe, only much cheaper. Plus the satisfaction of having made it yourself. Win-win. I love enjoying smoothie bowls for breakfast but let’s be honest… they’re awesome any time of the day! 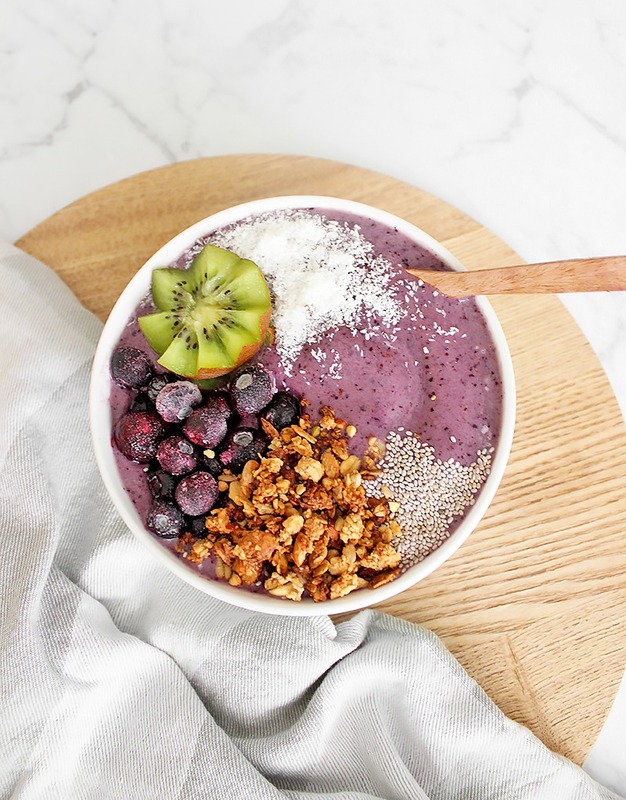 Smoothie bowls are very popular within the health and wellness realm and because of this, they can be quite pricey at cafes and restaurants. However, they’re really very simple to make and don’t usually have many ingredients in them. If you make them yourself there’s the added benefit of adjusting the flavours and toppings to suit you. An important part of smoothie bowls are the fruit and more specifically, frozen fruit! Using frozen fruit makes your smoothie bowl icy, thicker and not too sweet, it’s more like a soft serve ice cream this way. I like to start by adding my frozen fruit, for this recipe that’s a banana and some blueberries, to a blender with a couple of blocks of ice. Then I pour in half a cup of plant-based milk ( I use almond milk) with half a cup of chilled water, this just ensures that everything will stay nice and icy. Next, I pop in whatever powders I’d like to add, depending on the type of smoothie I’m making, it could be superfood powders like maca and spirulina, or it could be a vegan protein powder. 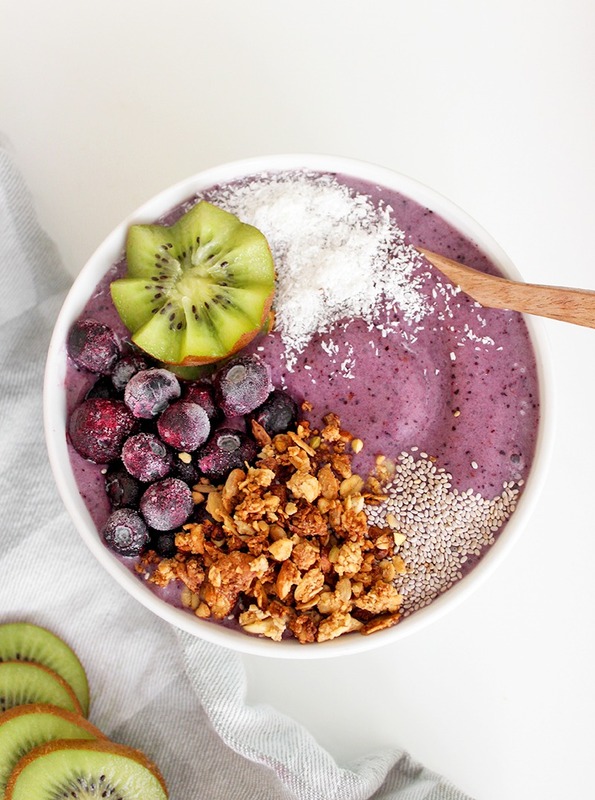 Blend everything up, pour your smoothie into your favourite bowl and add your toppings. It’s that simple! NOW THE FUN PART – TOPPINGS! For me, this is the best part of the smoothie bowl and where you can have loads of fun making your bowl pretty and colourful. 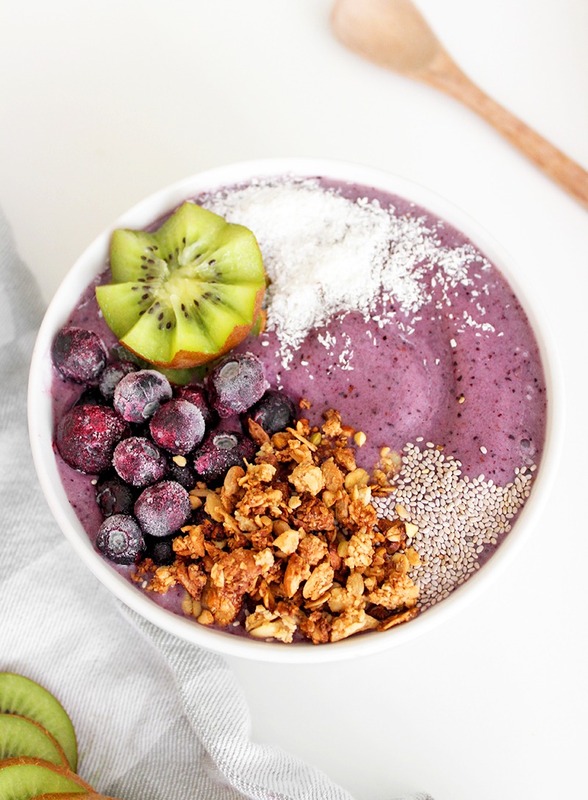 I usually keep it fairly simple but a quick search on Pinterest will give you all the smoothie bowl toppings inspiration you need! If you’re after more easy vegan breakfast ideas, check out my Classic French Toast and my Savoury Chickpea Pancakes! 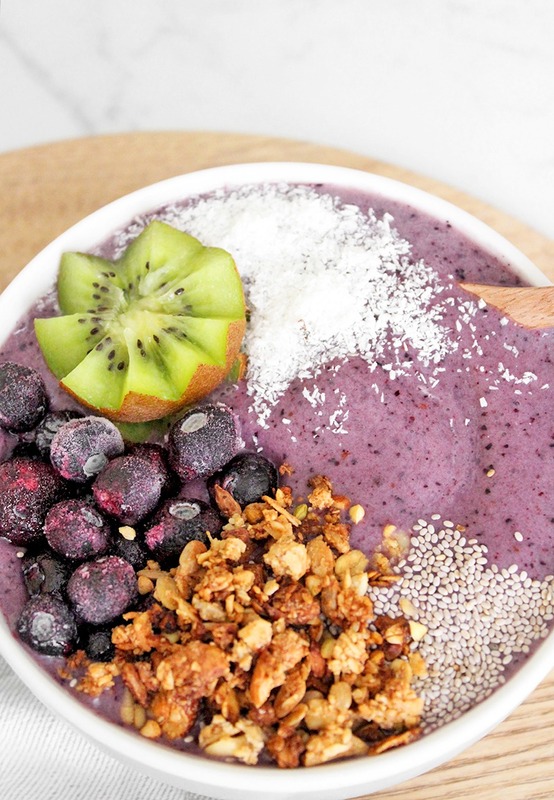 Going to make this Blueberry Banana Smoothie Bowl? Make sure you share your pics with me on Instagram, just tag me @lemonthy.me! Also feel free, as always, to leave any questions, comments or suggestions below. In a blender, place the frozen banana, frozen blueberries, almond milk, water, maca powder and ice cubes. Blend until everything runs smoothly and there are no banana chunks left. The amount of time will vary depending on your blender. Pour your smoothie into a bowl or large mug, add your toppings of choice and enjoy! 1. Add your favourite protein powder for a post-workout meal that will keep you full for longer. I just love the color blueberry gives when you blend it for smoothie, can easily manage to uplift the mood!